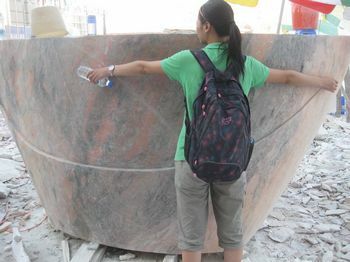 How many people does it take to polish 2 huge blocks of marble? A far as my sculpture Cloudstone is concerned it took 3 days starting with 2 people and ending up with 7. It seemed to me that the workers showed little regard for going through the grades from coarse to fine but somehow it all seemed to work out OK. The final polish was done wet. The accepted way of getting water onto diamond blades and pads or stone sculptures is to run a plastic tube from a bucket full of water placed on a wooden stand or on top of the sculpture and siphoning the water through. Simple but effective. 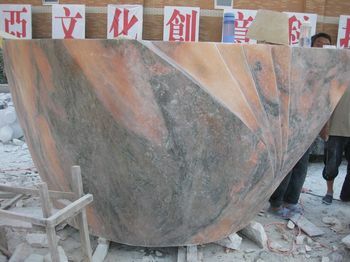 The polished marble looks amazing with very rich warm colouring in the base block shot through with blue/grey streaks. The top block however is not so dramatic and has muted yellows and pale orange as the predominant colours. 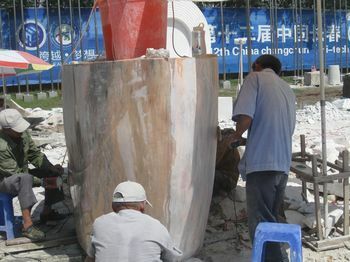 With a few exceptions all the sculptures are currently being assembled at the northern park site some 50 ks from Changchun. The site is still being developed so we sculptors are not sure what we will find when we are finally allowed to visit the site later this month. Before we leave China most of the sculptors will attend the International Sculpture Conference here in Changchun. I believe there are 300 invited guests many of whom will present papers over the 2 days of the conference.